Agency, Lower Brule Agency, Rosebud Agency, Sisseton Agency, Yankton Agency and Pine Ridge Agency. Pine Ridge was located in the South West corner of South Dakota on the Nebraska border and originally consisted of approximately 2.7 million acres, roughly the size of Connecticut. Over the next 45 years the reservation lost an additional 700,000 acres mostly through the process of forced fee-patenting, a practice introduced into the GAA with the 1906 Burke Actand ended with the passing of the 1934 the Wheeler-Howard Act. Today, of the remaining 1,773,716 acres of land on Pine Ridge, nearly 1,067,877 acres (60%) is allotted to individuals. Over a century of unplanned inheritance has created a situation where lands have become severely fractioned. This created a management nightmare where, in order for a land owner to utilize their lands, they may have to get the signed approval of dozens, hundreds or even thousands of separate land owners. As a result of this complexity, most land owners on Pine Ridge have few choices be-sides leasing their lands out as part of the Tribal/BIA Range Unit leasing system. 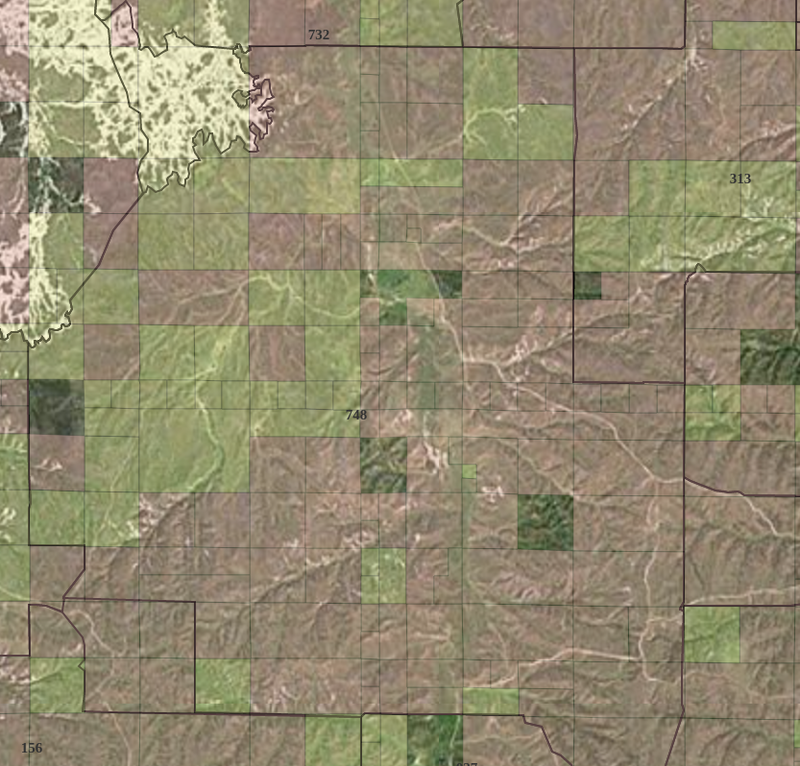 Nearly 65% of all lands on Pine Ridge are included in these Range units. Naturally, this situation has had a dramatic impact on the overall economy on Pine Ridge. Like other Reservations across the United States, fractionation is a major obstacle to housing and business development but also native owned farms and ranches. According to the USDA 2012 Census of Agriculture for American Indian Reservations, the market value of agriculture commodities produced on the Pine Ridge Reservation in 2012 totaled $87 million. Yet, less than 1/3 ($24 million) of that income went to Native American producers. According to a survey conducted by Colorado State University, it was found that most people on the reservation believe that the Lakota people should be managing reservation lands, not the non-tribal lessees, State or BIA. Despite this situation, many opportunities exist to stop and even reverse the problems created by the General Allottment Act. Here you will find simple, step-by-step instructions on how to take advantage of the various options available to you. Range unit on Pine Ridge (outlined in black) containing numerous individual and Tribal parcels. Screenshot from PRLIS. While some individuals have full ownership over their allotted lands, most individuals on Pine Ridge own undivided interests. This means that they own land within a specific parcels along with tens, hundreds or even thousands of other land owners yet there is no way to say “which” piece of land you own. In order to be able to utilize your land you first have to get the approval of a majority of the other land owners. The Indian Land Consolidation Act describes how many people have to agree and “sign-off” to be considered a majority. According to the BIA “With the passage of the 2000 Indian Land Consolidation Act (ILCA) the government created a sliding scale to determine how many people a land owner had to get approval from to the use the land. Under the ILCA, the superintendent can act on behalf of the undetermined heirs and individuals whose whereabouts are unknown to achieve the required consent,” but this is very rare. According to the BIA “Sometimes the BIA superintendent can grant on behalf of all undivided heirs without their express consent so long as they are fairly compensated and all statutory requirements are met.” For example, surface leases may be granted after a three month negotiation period if none of the owners is in possession. If the heirs cannot negotiate a lease within 90 days, the superintendent can sign a lease – usually afer advertisement – at fair market value on behalf of everyone. Many agricultural leases and grazing permits are made through grant authority. An individual or group of co-owners contacts the Bureau of Indian Affairs office about proposed use. A land appraisal is completed to determine land value. Appraisals are done through the Office of Special Trustee (OST). BIA sends out notices to all co-owners to ask for consent of proposed use. The BIA Realty officer sends a recommendation to the BIA superintendent once the required number of co-owners have consented. They also provide proof that an attempt has been made to contact all co-owners. The BIA superintendent makes a ruling based on the recommendation of the BIA realty officer. When appropriate, a lease is made. Non-consenting co-owners will receive fair market lease payments. As a Native land owner, what options exist for you to consolidate your undivided and/or fractionated lands? The tabs below describe some options available to. A gift deed (also known as gift conveyance) is a simple way to transfer land from one owner to another. The requirement of a land appraisal is waived if the land is being gifted to a spouse, brother, sister, lineal ancestor of Indian Blood, lineal descendant, or collateral heir. For example, a mother to her 4 children, while she is still alive. The BIA superintendent must approve all gift conveyances. For more information contact the BIA Realty office in Pine Ridge. Land exchange can be a powerful tool for land owners to consolidate their undivided interests into a single tract of land. According to Oglala Sioux Tribal Resolution 77-11 (see Appendix 1, page 89), individuals may exchange their allotted land with the Oglala Sioux Tribe as long as the lease income is the same or greater than the lease income of the Tribal land they wish to exchange for. There are other criteria besides lease income that may prevent a land exchange with the tribe. According to resolution 77-11, all land exchanges must be for the best interest of the Oglala Sioux Tribe and its members. The tract of Tribal land must not be considered “non-exchangeable.” Lands are considered non-exchangeable if they are being set-aside for future growth and development on the edges of towns or along major roads. Tribal Ordinance 85-17 (See Appendix 2, page 91) lists the criteria for “set-asides. Lands surrounding the townsite of Pine Ridge and the established villages within a radius of 3 miles of such settlements. Note: The PRLIS has a 3-mile buffer layer that you can use to identify eligible lands. If you are interested in consolidating your lands into one tract, below you will find the steps you need to follow. You can also use the flow chart on the next page to decide what information you need to complete a land exchange application. Use the PRLIS to identify your lands and how many acres you own by obtaining your individual interest report (also known as your “Heirship Card”) by contacting the BIA Realty office or Office of Special Trustee (OST). See the Land Exchange Decision Chart for contact information. Using this book, you can identify a piece of tribal land (yellow-hatched area on the maps) that you would like to exchange your lands for. Keep in mind that not all Tribal lands are available for exchange. Use the list of criteria above or contact the OST Land Office to determine if the Tribal land you want is exchangeable. Complete a land exchange application (See Appendix 3, page 93, for a sample Land Exchange Application). You can have one mailed to you by contacting the BIA Realty office in Pine Ridge BIA Realty Office Main St. Pine Ridge, SD 57770. Phone: (605) 867-1001. When the BIA Realty office recieves your land exchange application, they use the following review process to determine whether the proposed land exchange meets the criteria established in Tribal Resolution 77-11 and Tribal Ordinance 85-17. Once the application is received at the BIA Realty Office in Pine Ridge, they send it to the OST Land Office to check if the land has been previously exchanged or if the Tribal Tract is considered non-exchangeable. If the Tribal land is non-exchangeable, they inform the applicant in writing, and return the application to the BIA with a copy of the disapproval letter. If the land is exchangeable, the OST Land Office sends the application back to the BIA Realty Office for lease verification. The BIA Realty Office sends application and lease verification back to the OST Land Office. If the lease income on the allotted lands is less than the income on the Tribal land, they inform the applicant in writing and return the application to the BIA Realty Office with copy of disapproval letter. If lease income is equal to or higher than the desired Tribal land, the OST Land Office orders a visual inspection and then files the application with a copy of the letter and field check requests in a folder. They also document the date of the request on a separate card along with all other pending requests. If the OST Land Committee approves, the OST Land Office is required to order an appraisal from the U.S. Office of Special Trustee. They return the application and titles to the BIA with a request letter. They then file the remaining information in a pending exchange file. After appraisals and titles are received back from the Office of Special Trustee and BIA, The OST Land Office confirms that all information is correct. Next, they figure appraisals and review the appraisal photo, if provided, for improvements that the field check may have missed. OST Land Office presents exchange proposal to the Land Committee if income values and acres are equal or greater than OST’s. If not, they inform the applicant in writing and return the application and denial letter to the BIA Realty office. If approved by the Land Committee, the OST Land Office types an Executive Committee Resolution, release of liens and presents it to the Executive Committee. Then they have the Trial President sign a Release of Liens. If approved by the Tribal Council, they then submit the approved Resolution, release of liens, and lease income verification to the USDA Farm Service Agency (FSA) to ensure that they will not lose any lease income which is paying back loans made to the Tribal Government. When FSA returns the information, the OST Land Office has the President and Secretary sign the Release of Liens then submits original release of Liens, a copy of the resolution, the lease income verification, and the BIA’s file to the BIA Realty Office. After BIA submits all copies of deeds with document numbers, the OST Land Office closes the file by removing it from the “pending” file and moves it to the “approved” file. NOTE: OST Land Office track of each step of this process on index cards to make it easier to inform you where your application is in this process. To ensure the fast processing of your application, it is important that you keep track of where it is at each step of this process. The Range Units Leasing Program of today was established under the Indian Reorganization Act, which combined individualy allotted lands and tribal lands into large fenced off tracts that could be leased to both tribal and non-tribal members. The historical legacy of forcefully alienating people from their allotted lands has contributed to the unequal land-use patterns on Pine Ridge today, where 20 people control nearly 46% of the land base. It has also had a significant economic impact for tribal members. According to the USDA 2012 Census of Agriculture for American Indian Reservations, the market value of agriculture commodities produced on the Pine Ridge Reservation in 2012 totaled $87 million. Yet, less than 1/3 ($24 million) of that income went to Native American producers. The land will be used by you or your immediate family only. That land must be fenced by the land owners. You will not hold the BIA liable for any damages to the land while it is controlled by you. The BIA Superintendent must give the existing permittee 180 days notice of withdrawal, unless all parties concerned agree to the withdrawal. Withdrawals will be effective on the anniversary date of the Grazing Permit. Maybe you are one of the many people who do not own any land on Pine Ridge. Or maybe, you do own land but do not want to go through the trouble of getting consent from other land owners or filing for a land exchange. Leasing land may be the option for you. The applicant goes to OST Land Office for the Legal Land Description on the Tribal Land and Verification that the tract is available for lease. The applicant takes the land description to BIA Realty Office and completes the Application to Lease. For 100% Tribal land, Residential and Business Lease applications, the Applicant obtains the signatures of one OST Tribal Council Representative and Two District Executive Board members, in the district which they are applying for a lease. The completed application is returned to the BIA Realty Office. The BIA Realty Office completes the Routing Sheet and submits it along with the Application to the OST Land Office. The OST Land Office Field Technician reviews the application to make sure the land description is correct. he then does the field inspection. An aerial Photo is completed. If everything is in order, the Application is submitted to the OST Land committee for review and approval. If the application is approved, it is sent back to the BIA for preparation of the Lease contract. The lease contract is sent to the applicant by certified mail with instructions on signing and indicating the amount of money needed for the fees and lease payment. The letter also gives a time frame for completing and returning the forms. After the lease contract and other documents are signed and returned to the BIA, they are routed to the OST Land Office for the signature of the Land Director and the President of the Tribe. The lease contract is sent to the BIA Aberdeen Area Office for recording. When it is returned to Pine Ridge BIA Realty Office, they send a copy of it to the OST Land Office. The BIA Branch of Realty has informed the OST Land Office that they are now requiring environmental assessments, archaeological clearances, and certified surveys on new ground that is broken for housing and business sites, especially for long term leases.